Snowflake treats to enjoy for their pleasure this holiday season! 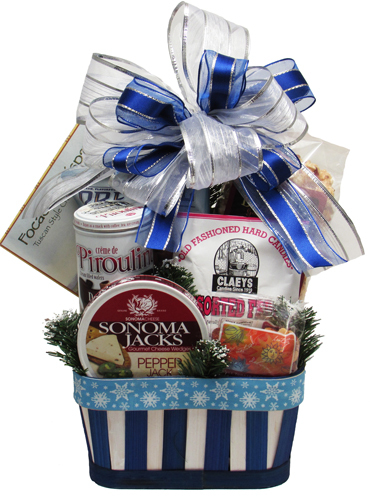 This great looking basket is filled with Cheese, Nuts, Hard Candies (Assorted fruit or Lemon), Salted Caramel Pretzels, Gourmet Popcorn (Cranberry Walnut Crunch, Chocolate Crunch, or Pecan Almond Crunch), tin of Chocolate filled Wafer Rolls, and a box of Focaccia Crisps Crackers, all nestled in frosted silk evergreens. Wrapped in crisp clear cellophane and topped off with a handmade bow. Includes a Handwritten Greeting Card. Finished decorated design for hand delivery approx. 16"h x 9"l x 9"w.